The best home furnishings and décor don’t mean much if the room isn’t properly lit. Interior lighting helps to create just the right ambiance for the different rooms in your home. Lights provide illumination for the various tasks you might handle, whether preparing meals, reading, crafting or something else entirely. Specialty light fixtures add to the décor of your home, blending nicely with a certain style or serving as a decorative accent piece to an already furnished room. With the right lighting options, you improve visibility in the home, making certain areas safer, and you also set the mood you are hoping to achieve for your family and your guests. Proper lighting choices can enhance any room. The key is knowing what you have to work with and what you are trying to achieve. Choose ambient lighting to project a feeling of coziness and relaxation. This soft level of light is far from overpowering and it adds just the right sentiment to a room. When you sit down to read, work on a puzzle, or to begin a craft project, functional lighting becomes extremely important. Cooking and other kitchen projects also call for appropriate task lighting to ensure meals are cooked and goodies baked according to plan. Task lighting tends to give off a brighter glow for the purpose of completing these and other activities. Install the right level of task lighting to ensure you and your family members get the most out of each room in the home. When you want to emphasize a certain focal piece of a room, such as a portrait or other piece of artwork, accent lighting can do the trick. This type of lighting typically works well along the walls and corners of a room, but can be effective in other places as well. Choose focused lighting to create a little drama in a certain corner of the room or simply enhance the mood further with the power of a little accent lighting. 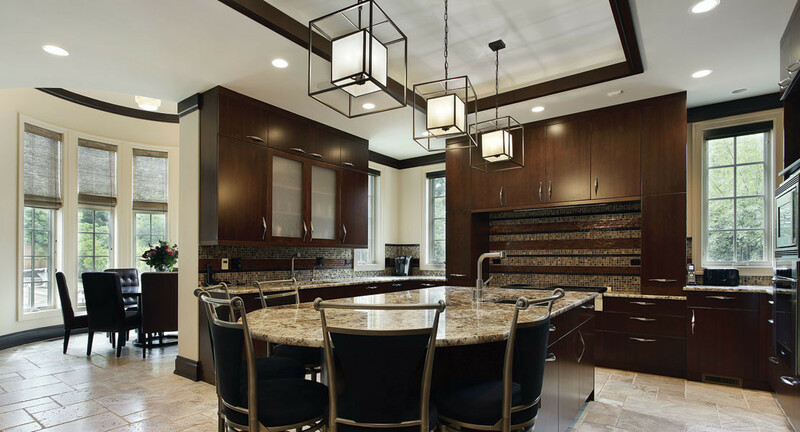 Accent lighting works especially well when it is built into the home’s unique architectural elements, such as built-in shelving or cubbies, tray ceilings, or on a specialty display. Small spotlights may help to call attention to the artwork or portraits you want to accentuate in a room. Decorative lighting options, like chandeliers, work well in formal settings like dining areas and the grand foyer of the home. You may also consider decorative lighting in your great room or other rooms with vaulted ceilings. Modern decorative lighting fixtures may make it easier to choose fancy options for bedrooms and other main areas of the home. Rather than looking at lighting as one big project for the whole home, look at it as a project to tackle individually in each room. Looking at just one room at a time, try to see what lighting options would add the most aesthetically as well as functionally to that particular room. For a bathroom or bedroom, choose task lighting around the mirror, but avoid the overhead lighting and the light affixed on top of the mirror – these will add years to your reflection by way of harsh shadows and too much light cast in the wrong places. Instead, choose lighting for the sides of the mirror and other prominent locations. Your bathtub and the beds may benefit from a decorative lighting option, adding to the beauty and serenity of the room. For the kitchen, choose effective task lighting to prepare all your meals with ease. Pendant lights may add a nice visual effect while casting just the right illumination over the sink. An overhead light can illuminate the room for cleaning, but be sure to have a dimmer. Don’t forget a decorative light over the dinner table. The dining room typically works best with a dramatic decorative light like a chandelier over the table, keeping the focus on the food and the dinner guests. Indirect lighting like wall sconces, small table lamps, or even candles placed only where needed can help to create a relaxed mood. Remember not to overlook natural lighting as well. While it won’t last long into the evening hours, there’s still something stunning about the sparkle of natural light shining into your kitchen or sun room. Gail Gray Dunn is Proprietor of GailGray Home Furnishings and Design. She has worked as an interior designer for 30 years, starting her own business 15 years ago as Accessories, etc., and changed the name to GailGray 7 years ago.